Ready for a rarity? Today’s choice is an all-but-forgotten blast from the past! 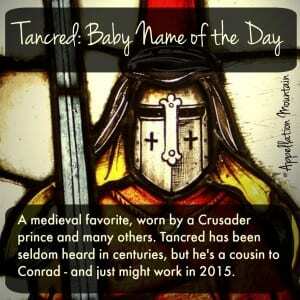 Thanks to WF for suggesting Tancred as our Baby Name of the Day. There’s the English Tancred, the Italian Tancredi, the French Tancrede, and the Spanish Tancredo. No form of the name has ever registered on the US Social Security charts. That’s really rare. But this name once was reasonably well known. It comes from the Germanic elements meaning thought and counsel – the second element is shared by stylish Conrad. 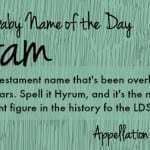 Let’s start with the most famous bearer of the name. Born around 1075, he set off for the Holy Lands with the First Crusade in 1096. The crusaders took Jerusalem, and Tancred became Prince of Galilee. Legend has it that he behaved honorably on several occasions. Most notably, he tried to save a group of Jerusalemites who took shelter at the Temple of Solomon. Tancred also served as regent for his uncle Bohemund, Prince of Antioch. But it’s a fictional version of the crusader prince that is better known. Torquato Tasso penned Jerusalem Delivered in the 1500s. His Tancred was based on history, but only in part. His love interests, the pagan warrior Clorinda and the Christian Princess Erminia, were both inventions. Monteverdi retold the story of Clorinda and Tancredi in an operatic scene in the seventeenth century. Then came operas by Campra in 1702 and Rossini in 1813. Voltaire wrote Tancrede in 1760. Tancred also appears in Sir Walter Scott’s 1832 novel Count Robert of Paris, and Benjamin Disraeli’s 1847 The New Crusade references the historical figure, too. There was no shortage of opportunities for parents to re-discover the name, and yet it seems to have remained rare over the years. The Prince of Galilee was named after his ancestor, Tancred of Hauteville, who lived in the early eleventh century. He married twice, had twelve sons and a couple of daughters, and their descendants went on to marry well. Their family tree is packed with interesting names: Muriella, Fressenda, Serlo, Drogo, Mauger, Aubrey. A ninth century abbot in Prum, Germany – though his name is usually spelled Tankrad. A twelfth century King of Sicily. A twelfth century Prince of Bari, also descended from the Hauteville family. 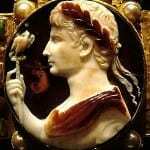 Yet another Hauteville by the name was the Count of Syracuse, a Norman county in Sicily. Boccaccio gave the name to a character in his Decameron, written in the fourteenth century. In Alan Bradley’s Speaking from the Bones, young crime-solver Flavia de Luce finds a body in the tomb of St. Tancred. There were two distinguished Dominican friars in the twelfth and thirteenth centuries by the name, but neither is listed as a saint. But there is a Tancred of Thorney, a monk who died in the ninth century at the hands of Viking invaders – a martyr saint. 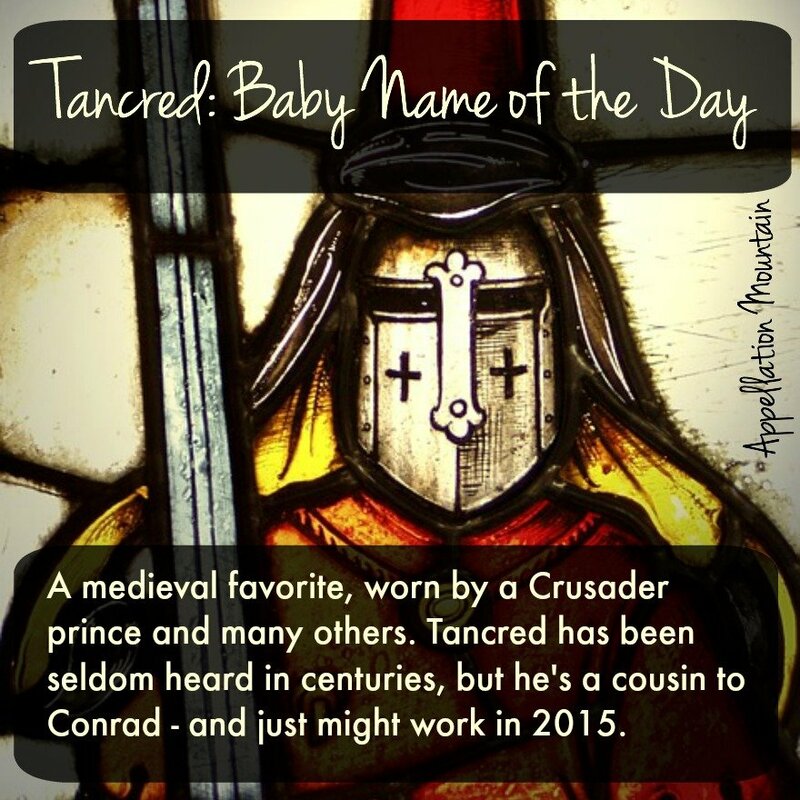 Tancred also survives as a surname, sometimes Tancredi. But it’s also the source of Tanqueray – as in the gin, named after Charles Tanqueray, the Englishman who first distilled the spirit in London in 1830. It’s hard to explain why some obscure names survive and others are discarded. Tancred seems especially accessible – it is spelled and pronounced exactly as you’d guess. If you’re after a medieval rarity that will surprise, Tancred could be the name for you. What do you think of Tancred? Is it best left to obscurity, or ready for revival? Although it sounds like it’s spelt, nobody ever spells it right! But lots of people say it’s interesting and ask where it’s from. James Aitcheson has recently used it as his lead in his books set around 1066. Nope, not this one. Sounds fake. I realize it isn’t fake, but it sounds like it is. Yep, I instantly thought of the Tancred in the Charlie Bone books (which made up a significant chunk of my childhood.) Tancred is kind of like the schoolboy version of Thor — he can call up storms at will. Not a bad association for a little boy to have. Wow, how have I never heard of these books? Going on my list of things to read with my kids! My first thought when I see this name – in the film The Ruling Class, it’s revealed to be one of Peter O’Toole’s character’s middle names at one point (Jack Arnold Alexander Tancred Gurney). It’s a bit of a punchline, because his character is so posh. Really? I’m going to keep an eye out for that one on Netflix/Amazon. And yes, that does make for quite the posh name, doesn’t it? There is also a character named Tancred in the Charlie Bone series of books. I’ve always loved this name, and thought it would pair nicely with Tarquin. Don’t forget the the Italian Rock guitarist, Tancredi Palamara, he goes by Tank for short. Also, according to wiki, Tancred is an unincorporated community in Yolo County, California. It lies at an elevation of 299 feet (91 m). Thank you soo much for doing this post. I’m just soo happy to see the name in a post. It is a great rare gem that should be revived. You mentioned the name was a surname. So I checked wiki on “recent” known people with this surname.